Molasses is an ingredient we reach for when making gingerbread cookies, baked beans, and barbecue sauce. It is a byproduct when making sugar, the resulting dark-colored syrup after the sugar crystals have been removed and the mixture has been boiled. Molasses adds a rich, sweet, but slightly burnt flavor to baked goods and savory dishes alike. (Brown sugar contains molasses, giving it its distinctive flavor; dark brown sugar contains a higher concentration of molasses than light brown sugar.) It is a unique ingredient that does not have a clear substitute, but there are some tips you can follow to create a similar flavor. Before you start looking for an alternative, however, you need to know which type of molasses your recipe calls for. There are several types of molasses, each distinguished by how many times the syrup has been boiled, as well as if anything has been added to it. After the first boil, light molasses is produced. It is light in color and mild or sweet in taste because only a small percentage of the sugar has been extracted. Dark molasses is created after the second boiling and is, naturally, darker in color, less sweet with a hint of bitterness, and has a thicker consistency. Dark molasses is the type commonly used in gingerbread. After the third boiling, molasses known as blackstrap is produced. It is very thick and dark and contains the most vitamins and minerals (and is known to have many health benefits), but also comes with a robust flavor and definite bitterness. You can purchase either sulfured or unsulfured molasses of any of these types. Sulfur acts as a preservative, but it leaches the sweetness and can leave a faint chemical-like aftertaste. Even unsulfured molasses lasts for several years in the pantry. Molasses not only contributes a distinctive flavor to dishes but it also has certain properties when cooking the dish. Molasses contains calcium, which retards softening in some foods, particularly beans. Baked beans with molasses as a flavoring cook much more slowly than beans without it. On the bright side, the calcium in the molasses helps the beans retain their shape. When it comes to baked goods, molasses adds moisture as well as another dimension of flavor. Nothing quite replaces real molasses, but if you find yourself without, you can make some reasonable substitutions. On the other hand, there are some substitutions you definitely do not want to attempt. Dark treacle can be swapped for molasses in recipes. Use equal measures—if the recipe calls for 1/4 cup molasses, use 1/4 cup dark treacle. Dark corn syrup works in place of molasses as a one-to-one substitution, but with less depth of flavor and a more simplistic sweetness. In baking, you can substitute 3/4 cup of granulated white sugar plus 1/4 cup of water for 1 cup of molasses, but increase the spices to compensate for the loss of the molasses flavor (and add 1 teaspoon of baking soda to the dry ingredients per 1 cup of molasses when you substitute refined sugar for molasses). You can also replace 1 cup of molasses with 3/4 cup of dark brown sugar to retain the molasses flavor. 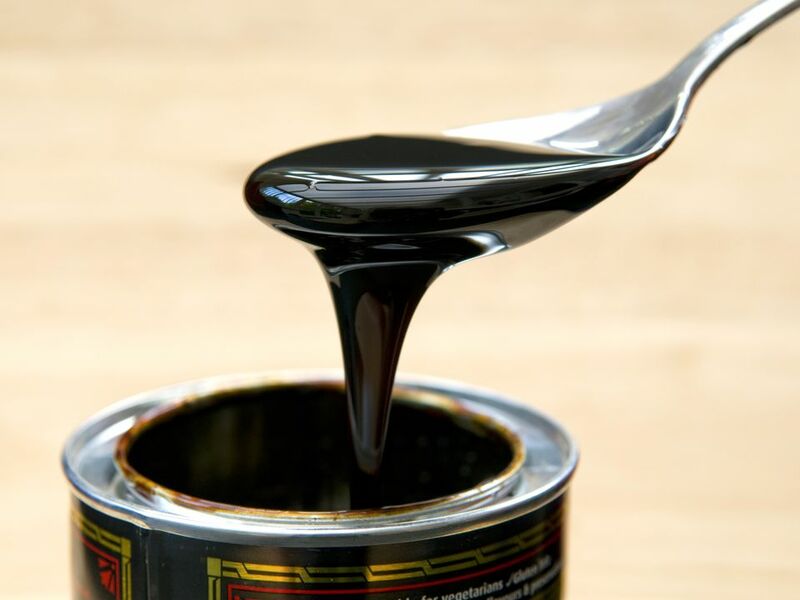 Although you can interchange light and dark molasses in recipes, using the dark version intensifies the flavor and slightly darkens the resulting product. Dark molasses works well in gingerbread, baked beans, and darker bread such as pumpernickel. Do not substitute blackstrap molasses for light or dark molasses; the resulting flavor may overpower the recipe. Only use blackstrap molasses if a recipe specifically calls for it. A 12-fluid-ounce jar of molasses contains approximately 24 tablespoons or 1 1/2 cups. Measure molasses by volume in a liquid measuring cup. Lightly spray the measuring cup with vegetable oil before measuring molasses so it slips out more easily. Baked goods using a lot of molasses tend to darken more quickly. Reduce the oven temperature by 25 degrees to compensate. Naturally acidic molasses may require the addition of baking soda to counteract it in some baked goods.